One subject character illustration, bust up, with full colour. To add additional characters or a detailed background, please check out the add-ons section! Please read the section on “About My Paintings” to read more about my process. 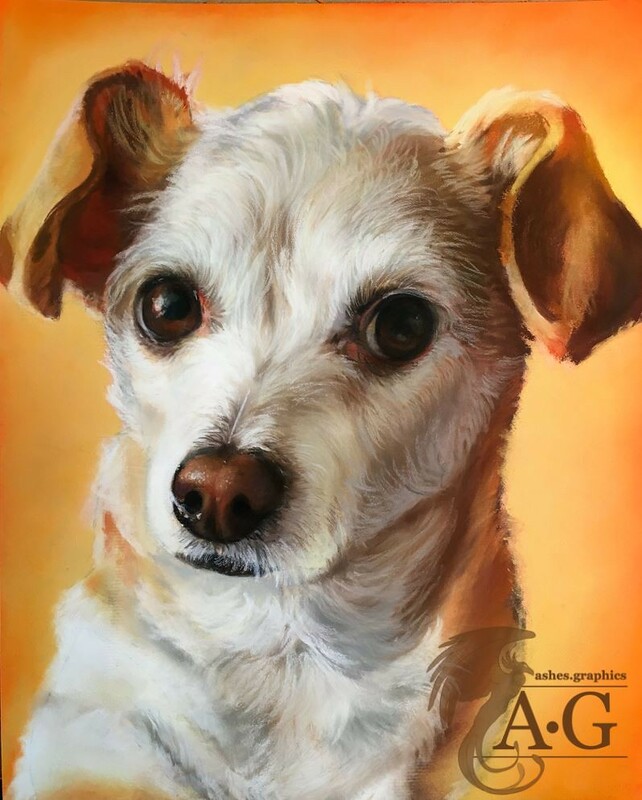 Your commission work will include a full, freehand digital painting to your size and specifications. Please note, digital painting is not digital photo manipulation and it is not a photograph; it is completely from scratch and freehand. It can also be more time consuming and difficult than working with acrylic and oil, as each detailed stroke and texture must be done individually by hand. That means if you see individual hairs on your portrait of your dog, each hair was drawn, shaded, and lighted individually by me. Each painting takes between 50-60 hours to complete. All paintings will include a download file of a high resolution jpeg and pdf included in the listing price. Each listing is for one subject: if you would like multiple subjects in your piece, a $50 charge will be added for each addition. Different background colours are available, let me know what you have in mind and I will work with you to choose the colour that would work best to compliment your subject. Detailed backgrounds are also available as an add on. 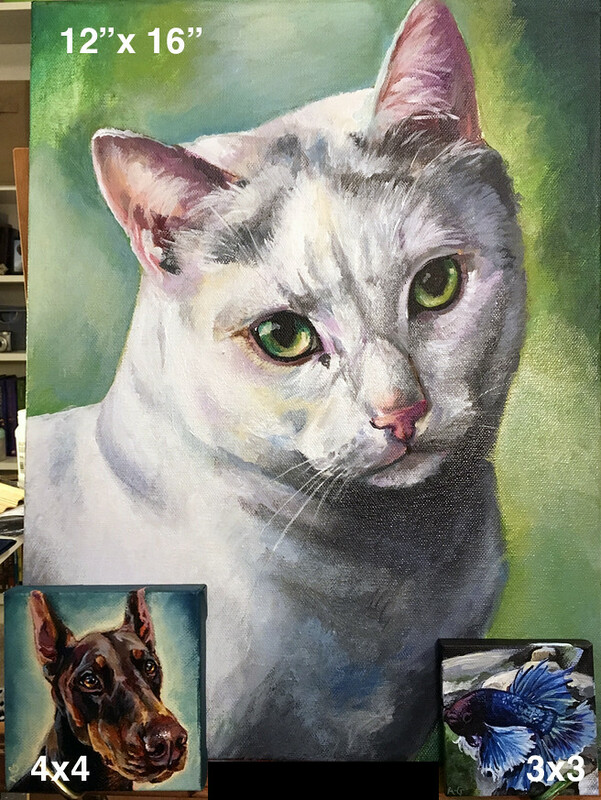 In order to make your painting, I will need a photo or reference of your desired subject(s)! I prefer these photos to be as clear and high resolution as possible. The more detailed photos you send me, the better and more realistic your work will come out. If you do not have a specific clear photo that you would like me to focus on, it is best if you can send me as many clear photos as you can and I can tell you which photos are helpful or would look best as a painting. Single portraits without backgrounds will take an estimate of 1-3 weeks. They can take up to 5 weeks depending on the number of subjects and the amount of detail you’d like in your background. Please bear in mind, a typical portrait takes 50-60 hours; if I work 10 hour days and have absolutely no complications, I still will only be capable of finishing your portrait in absolute minimum of 6 days. You will be quoted a time estimate when we discuss your commission together, and you can tell me then if there is a time constraint. Rush orders may be available, depending on my workload, for an additional fee. Please consider your location as well for shipping, portraits can be shipped priority mail but it is much more expensive. Once you have read and understand about my commissions, it’s time to make some decisions on what you’d like me to draw for you. The size you’d like, in inches for dimensions please. If you are looking for a background, please order it using pixels. Number of subjects in your painting. Any time constraints you have. Please send pictures of your subject. Choose one that I can focus on or send several and I can tell you which I can use. Include this in your initial email, to ashes@ashes.graphics to begin the process. Together we will discuss the details, and once we agree on specifications I will ask you to purchase this listing. Once the painting is complete, I will send you a picture of what I have. Within 24 hours of receiving your initial portrait, you may let me know if you have any concerns or small edits you’d like me to do. 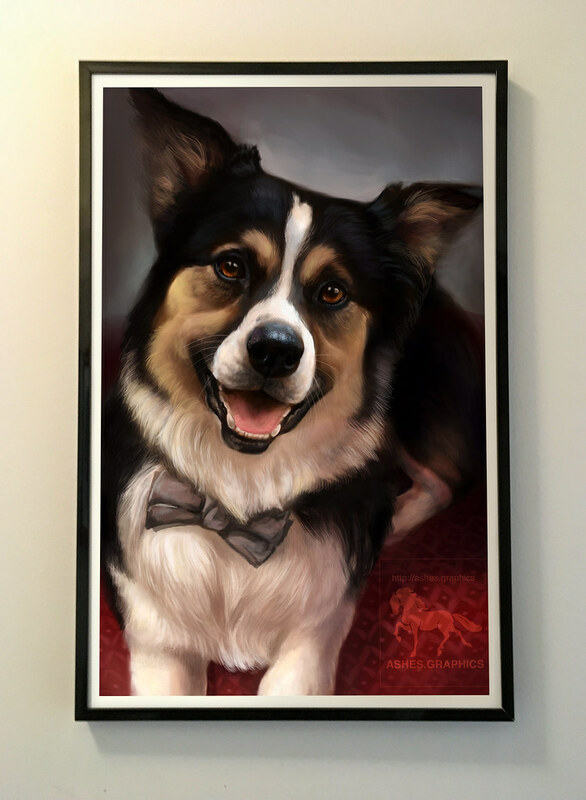 Upon your final approval, you may order your commission on canvas or simply download the high resolution file!